As U.S. Navy SEALs crept into Osama Bin Laden’s compound in Pakistan, President Barack Obama and other officials monitored the mission in real time, thanks in part to 25 sophisticated, miniature digital video cameras placed in the helmets worn by the SEALs. When Japan’s earthquakedamaged Fukushima Daiichi nuclear plant required damage assessment, robots equipped with computerized ‘eyes’ and automated video capability handled the perilous task, achieving situational awareness for those in charge without risking human lives. National Broadband Network initiates and 4G rollouts (Wi-Max, LTE) are making high speed wired and wireless networks more common — and untethering video from the conference room table. Wearable operational video (such as helmet cams), mobile cameras and sensors, and other visual technologies can provide crucial intelligence, which then can be gathered, communicated to personnel in disparate locations, and integrated to enable unified collaboration for public security responses. 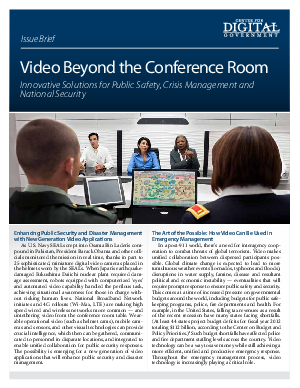 The possibility is emerging for a new generation of video applications that will enhance public security and disaster management.